By Robyn Mohs, Helena, MT. As I was telling someone about Reliv, she mentioned her husband, Bob, a Vietnam Veteran who came back with Agent Orange poisoning from the war. He was awarded the Defense Distinguished Service Medal and Purple Heart for wounds received. His health had been deteriorating over the years and he suffers from a multitude of health problems. He has a service dog, Ozzie, because he’s nearly blind. The first day Bob took two capsules of LunaRich X. He called the next day to say that he had slept for seven hours, which hadn’t happened in a very long time. Not long after his headaches eased and he was able to breathe clearly on walks with his dog. His health continued to improve that first month, so he started taking four capsules a day. He then called to say that he put on his own shoes for the first time in a very long time. On my next visit, Bob stood up from his recliner to show me he could touch his toes. Before Reliv, he couldn’t even reach his knees. It was more exciting that he could fluidly stand up on his own! 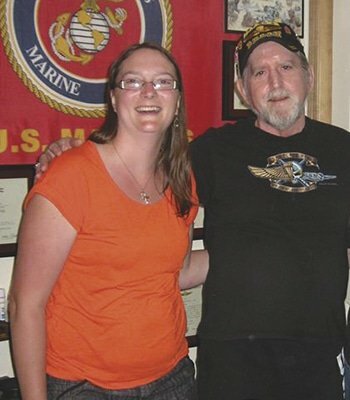 He recently had his blood work done through the VA, and his anemia of 20 years was no longer a concern and his liver and kidney function had improved. Bob ran out of capsules and stopped taking LunaRich X for a few weeks, only to see health problems return. He contacted me to say that he wanted more LunaRich X — immediately! He’ll never be without it again! Bob thank you for your service. The life-changing results with LunaRich keep pouring in!! !